With its north African and Mediterranean heritage, you’ll want similar conditions when growing thyme as you have for other Mediterranean herbs such as oregano, rosemary, and fennel. The thyme herb plays well with other herbs and has a tendency to make friends with other flavors easily. It’s also as attractive to multiple pollinators when it’s in bloom, so be gentle working around it at that time. 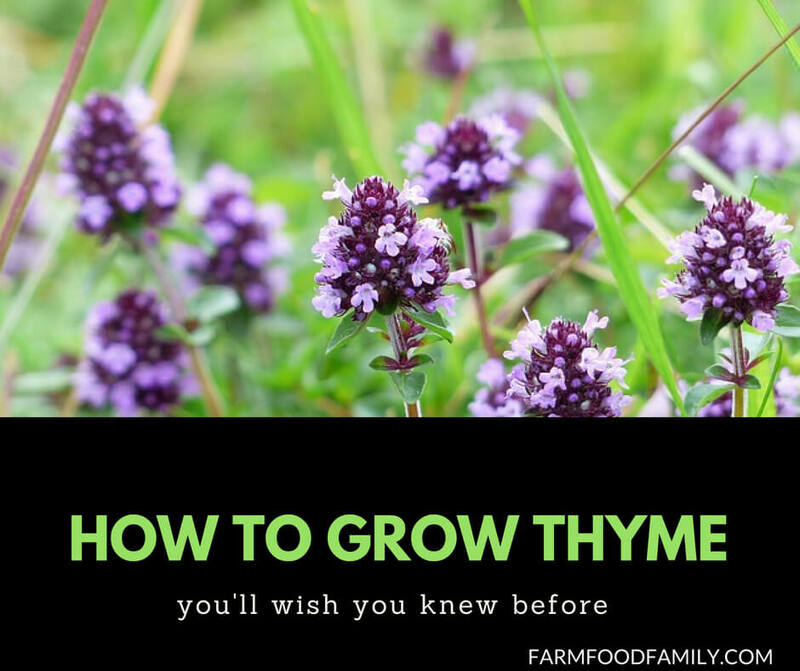 Below you will find a description of the thyme herb, including its height, hardiness, and flower; light, moisture, and soil requirements; cultivation tips for keeping your growing thyme healthy and tasty; our favorites varieties; and some ideas for how to use thyme in your home. Growing thyme assumes a number of postures, including prostrate or creeping varieties (these top out at 4 inches high) and more upright mini-shrubs reaching a full foot tall. Wider than high in most cases, a mature thyme plant can be 18 or more inches across. Considered a semi-woody perennial further north, many thymes are evergreen or nearly so from zone 5 south. This is an often-evergreen, drought tolerant herb available in groundcover forms, meaning it’s a great bet for cascading over walls and using in window boxes or other containers. Light: Full to part sun, a minimum of 4 or 5 hours of direct light each day. Moisture: on the dry side of medium/ moderate. Thyme is somewhat drought tolerant. Soil: Loose, gritty, well-draining soil, preferably a little lacking in nutrients and overall quality. Consider a light colored rocky mulch, preferably with a little bit of limestone in the make up. Start from seeds or seedlings, collect a root division of a more mature plant, or root out a cutting in the summer. Proper drainage is the key to success here. Southern gardeners: to induce thick growth in the spring, cut leafing sections back to within 2 inches of the ground. This can be done again in early-midsummer before it flowers although a third cut-back is not recommended. Northern gardeners: move that spring cutting to fall, about a month before first frost. The new growth that flushes after this cut will be hardier to the winter. Note: If you are inheriting an older plant, do not cut back into the old woody brown growth where the stems have hollowed. It won’t come back as thickly there. Doone Valley thyme is my personal favorite for looks. It has creeping tendrils of mostly evergreen, small, citrus-scented, gold-margined leaves in spring and fall and lovely pale purple flowers in summer. Silver Posie thyme carries white-margins around it’s fragrant, mostly evergreen leaves. This is not a creeping thyme but it is diminutive enough to make it a great edging variety in the garden. For sheer flavor, the classic is the large French thyme (T. vulgare). If you have only one and it’s for cooking, choose this one. But why have just one? I’d also recommend Lemon thyme (T. x citriodorus) for flavor as this citrus-y thyme is perfect for either sweet or savory cooking. Thyme was first employed by the Egyptians as an embalming ingredient and didn’t gain culinary popularity until Ancient Greece. Now its a staple in French, Greek, and other European cuisines. Use lemon-scented and flavored thyme sparingly in seafood, poultry, and fruit desserts. The more traditional thymes are perfect for flavoring oils and vinegars, soups, stews, tomato-based dishes, roasted meats, and steamed or boiled veggies. The more diminutive and creeping thyme forms are still somewhat useful in the kitchen, however I personally feel they’re more appropriate as an ornamental groundcover in the garden, between pavers, spilling out of retaining walls and decorative planters.